President Trump made history Tuesday as he and North Korean despot Kim Jong-un met face-to-face for the first time and signed an agreement to move towards peace and denuclearization, a goal only the liberal media would find something to whine about. 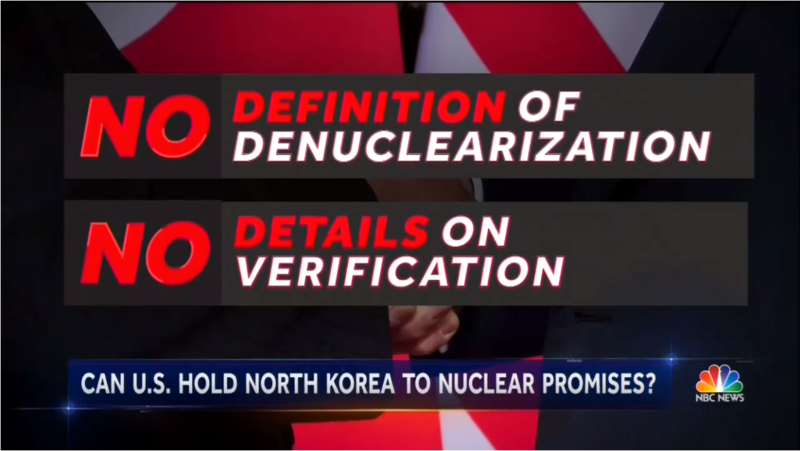 While broadcast networks ABC and CBS were skeptical about how the agreement would turn out (a legitimate concern considering North Korea’s history of reneging on such deals), NBC Nightly News took a noticeably harsher tone and railed against President Trump. This decrying of Trump’s agreement comes after NBC has gone to bat time and time again for the radical Islamic regime of Iran and against our President. “So after all the pomp and circumstance, what comes next? How does the U.S. hold North Korea to its commitment to denuclearize after its broken nuclear promises in the past,” anchor Lester Holt condescendingly wondered ahead of a report by chief foreign affairs correspondent Andrea Mitchell. Mitchell began her report by scoffing at claims by President Trump that he trusted Kim and his intentions. “How can the U.S. be sure? A key missing ingredient, no requirement that Kim Jong-un disclose how many weapons he has or where they are hidden,” she huffed. This pessimism was coming from the same NBC reporter who had apparently made it her mission in life to defend President Obama’s terrible Iran nuclear deal. Mitchell once asserted that any suggestion from Trump that Iran was a threat in some way was nothing but ploys. She rolled her eyes at Trump trusting Kim but on a trip to Cuba last year, she met some of their intelligence officials and bought into their claims of aiding U.S. intelligence officials, yet she never said if she confirmed it.